December 20th, 2009 Categories: Holiday Fun, Just for Fun! Today I finally went to my neighborhood fruit & veggie stand (Duane’s Garden Patch) and picked out a Christmas Tree! So here’s this year’s Christmas Tree decorated with bird ornaments. The cats, Niki & Oliver are dressed in their elf collars ( poor Sammy is still in her elizabethan collar) with Oliver checking out the tree. 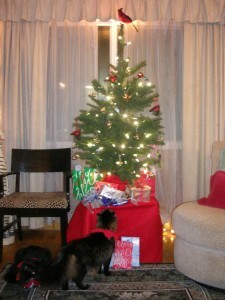 Hopefully I won’t find ornaments on the floor like last year that had been magically turned into cat toys! This entry was posted on Sunday, December 20th, 2009 at 9:28 pm	and is filed under Holiday Fun, Just for Fun!. You can follow any responses to this entry through the RSS 2.0 feed. Both comments and pings are currently closed. Can I just say what a relief to seek out someone who really is aware of what theyre speaking about on the internet. You definitely know find out how to bring a problem to gentle and make it important. More individuals need to learn this and perceive this aspect of the story. I cant consider youre not more in style since you definitely have the gift. I delight in the info on your internet site. Much thanks. I wanted to draft you one tiny word to help thank you very much once again for the gorgeous ideas you’ve shared on this site. It was simply open-handed of people like you to supply freely just what many individuals could have supplied as an ebook to help with making some profit on their own, even more so considering the fact that you might have done it in the event you wanted. The pointers additionally acted to be a good way to understand that other people have the same desire like my personal own to know the truth more and more with regard to this problem. Certainly there are a lot more pleasant instances up front for individuals who examine your site. First of all I want to say great blog! I had a quick question in which I’d like to ask if you don’t mind. I was interested to know how you center yourself and clear your mind before writing. I have had a hard time clearing my mind in getting my thoughts out. I truly do enjoy writing but it just seems like the first 10 to 15 minutes are generally lost simply just trying to figure out how to begin. Any suggestions or tips? Many thanks! Seriously, this is a invaluable web page. I found your blog website on google and check a couple of of your early posts. Proceed to keep up the very good operate. I simply extra up your RSS feed to my MSN News Reader. In search of forward to studying more from you afterward!? This site is known as a stroll-via for the entire info you wanted about this and didn抰 know who to ask. Glimpse right here, and you抣l positively uncover it. I must show appreciation to you just for rescuing me from this type of circumstance. After browsing throughout the online world and meeting principles that were not pleasant, I thought my life was gone. Living devoid of the strategies to the problems you’ve fixed as a result of your short post is a crucial case, as well as ones which could have in a negative way damaged my career if I had not noticed your web blog. Your actual expertise and kindness in handling every item was priceless. I’m not sure what I would’ve done if I hadn’t come upon such a solution like this. It’s possible to now relish my future. Thanks for your time so much for the professional and result oriented guide. I won’t think twice to refer your blog to any person who ought to have guidelines about this subject matter.